A card game can’t be aggressive…think again !!! Young Chihaya had no ambition for herself always looked up to her sister in her career in modelling. 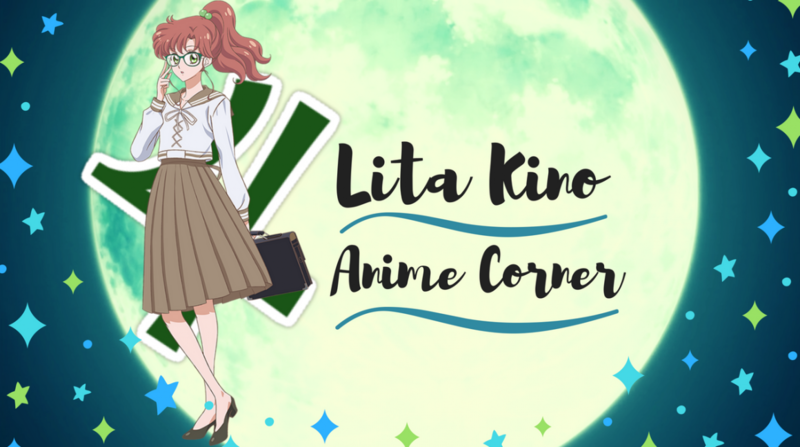 Everything changes when she meets Arata and introduces her to the game Karuta, along with her other friend Taichi their strong friendship grows. Eventually they all separate, reaching high school Chihaya’s love for Karuta has only grown wishing to for fill her dream to be the best player in Japan. Chihaya crosses paths with Taichi, they both form a Karuta club reaching for new goals with new team mates. 2016 is the year finally I watched my first sports anime, I don’t know why it took me so long. There was so many suggestions thrown at me, beloved shows such as Free, Haikyuu, Kuroko Basket but I wanted to watch something that was unlike other sports anime out there. Magnitude Anime Reviews a good blogger friend had been screaming at me to watch this for so long. I was going in blindly only thing I knew about this series at the start was based on a card game, ha so a card game can’t be all that aggressive right I thought? This series truly surprised me in so many ways. The basis of the show “Competitive Karuta” I thought was just made up in the beginning but after watching the whole of this series. To find out it’s an actual real thing played in Japan still today is truly fascinating. I still don’t understand entirety of how the game works but the representation of this unique game, what it in involves, in this anime was quite easy to follow and understand surprisingly. The whole basis of this sport surrounds poems, that are on each card having a different meaning, having a story behind it learning this was really interesting. You know when you love doing something so much, that you can get to the point of being obsessed with it, think of nothing else. Chihaya the star main character represented this relatable trait, her infectious love for Karuta quickly grew on me, before I knew it I was in love with her character. I love seeing in the beginning of season one of how her love for Karuta began, only from their just kept growing, Chihaya made me think about the things I love to do in my life. To me she was a amazing character, very pushy, acted before thinking things threw, little bit selfish at times. There was nothing she wouldn’t do to get to her goal of wanting to become the best player in all of Japan and become queen of Karuta, the hunger of reaching your goals, Chihaya’s passionate drive is inspiring to watch. It wasn’t just Chihaya’s love for Karuta that was inspiring, bringing a tear to the eye. One thing the show did fantastic at was every character from Chihaya’s team mates, opponents, rivals of seeing from their perspective on what the game Karuta meant to them. Every episode never focused just on one character but on various, it was thoroughly enjoyable to learn the back story on every characters love for the game. Swaying to the side of character cast, I loved all the characters in this show, each bringing something different to why they play the game Karuta. The ones that grew on me most was Chihaya’s team mates, they bring the true meaning of teamwork in a brilliant light. They each brought their own phoniness to the team, Taichi the level header thinker, Chihaya the cheering one, Nishida the strategists, Kanade knowing the meaning of the poems, Tsutomu the smartie. Either when they lost or won a match I would be crying, roller coaster of emotions this show takes. The different atmospheres this show can give off is insane, particularly the tension moments during a Karuta match of a player waiting for their card to be drawn. At times watching those scenes, It was so gripping made me feel like I was actually their but it was such a good feeling. The beautiful, warm and inviting animation is another detail that stood out for me while watching the show. It’s hard for me to explain but the animation heightened my enjoyment of the show whenever a match was taking place, in combination with a tension atmosphere, both together where you just could not take your eyes of what was going on even for a second. As much as I loved this show their were two issues I had first one is Arata’s character. I didn’t mind his character in the beginning, seeing him becoming friends with Taichi and Chihaya, that was cute to see but after that his character did nothing for me. The guy had a rough time getting over his grandfather death, going into a depressive slump but after a while it got old. I felt like he was hardly seen in the series, just at random points where he finds his love for Karuta again and takes part in the Nationals. He was a constant influence over Chihaya from her perspective you got to see but Arata in whole was a bit boring. I don’t care for him being this insane good Karuta player, I got to know Taichi’s character much easier than him. Second issue I had was the romance element, during the whole two seasons Taichi was the only one I could feel romance anything from. Chihaya the dense brick was hoping she might pick up on that but again left me feeling frustrated. Having the way the show ended didn’t help because the season three needs to happen like now. So many things were left inconclusive for me, I didn’t expect the show to end on a unsatisfying note. In whole felt the romance element was a little lacking, I feel like I will have to visit the manga to for fill my romance void on this one. In the end I was more focused on the sport plot basis but SEASON THREE NEED TO HAPPEN WAHAAAA !!! 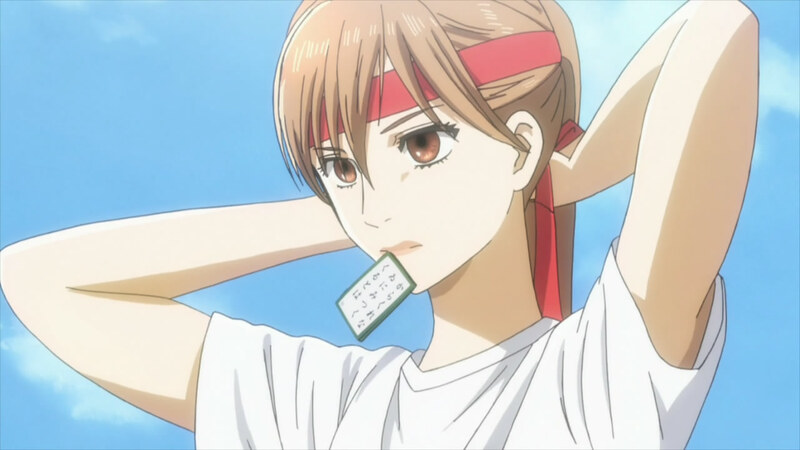 Chihayafuru I don’t regret being my first sports anime, so glad it was. It was such an enjoyable ride, experiencing too many waves of laughter and tears, this is a series that knows how to reach deep down. I got so much from this show, hitting my childhood nostalgia and learning the game of Karuta that is still played in Japan even today. Touching friendships and intense, exciting matches are Chihayafuru golden standouts. I think anyone who loves the sports genre guarantee to enjoy this and would recommend highly to first time sport genre watchers. I never knew till I watched this series a card game could be so interesting and aggressive. I really hope you all enjoyed hearing me talk about my first sports anime please comment below if you have seen this series. What are your thoughts on the series? Have I made you curious? I’ll explore more depth of this series in another post. ahhhh huge gap .. that’s sad to hear but I’ll read the manga still season three where are you to fill these holes !!!! I actually really liked Arata as well as Taichi. When Arata was all sulky got a little annoying, but at heart he’s really just such a cutie so precious. >< tbh I loved him most when he was a kid, but after he got over the upset was also great. I dipped into Free! as my first sports anime and I don’t regret anything. Even though I’ve only been around a couple since, nothing gets my adrenaline and inspiration pumping quite like a sports anime. They’re oddly intense and seem to teach me so much. Perhaps that’s the nature of companionship speaking, though. The art style on this one here is really warm and pretty, as you mentioned. I’ll have to check it out once the ice-skating season ends with Yuri!!! On ICE! Congrats on your first~! Such a fabulous series. I wish the bilingual manga went further than two volumes! No, the manga is a lot further along, but Kodansha in Japan started releasing it with English text, but only 2 volumes were released. It’s mostly a way for Japanese speakers to practice English, but it they can translate it, release it overseas! Haven’t yet seen this one, reminds me a bit of Hikaru no Go, with being a sport we wouldn’t consider “intense” but then heck yes it is! Now that you’ve finally been dragged to sports hell, what’s going to be your next sports show? OOhhh, Days, heard about it. Yay! Congrats, Lita! You finally watched sports anime. I hope you watch more. As for my experience with “Chihayafuru”, it was a suprise that I like it. I had no idea what karuta is and it frankly looked boring. The anime, however, made it look awesome and very intense. I really liked it and I’m glad that you did, too. Watch more sports anime! Take care. Cheers! I agree. And I’m looking forward to that follow-up post about Chihayafuru. Keep up the great work, Lita. I’ve not seen this one, but it certainly does seem like a departure from most of the higher octane entries into the genre. As a sometime poet, I’m very much interested in checking out this anime. I hope I enjoy it as much as you. This is one anime I heard of that looked interesting. It could be another Hikaru no Go for me (this is a compliment) since it deals with a game that hasn’t been previously animated before while making a good story out of it. I heard Chihayafuru was a point of redemption for the creator because she was caught plagiarizing Slam Dunk while making Flower of Eden, so she was on a hiatus, but then she made this fully original story and won at least one award.